“Talla Wara Talla” was a multi-faceted experiment containing some old El-Funoun classics, while examining original dance forms and styles, new costumes, non-traditional music, unconventional choreography and the use of special visual and sound effects. The work was presented as a collection of newly interpreted old dances and novel dances and songs that carried substantial elements of change. 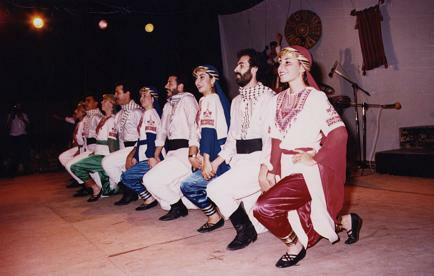 Overall, El-Funoun tried through this work to further develop its experience in creating contemporary Palestinian dance and stepping into a new space while maintaining the characteristic Palestinian spirit that stems from folklore, and that has always distinguished the Troupe’s productions. “Talla Wara Talla” opened an unprecedented space for dialogue between El-Funoun and its audiences enhancing further the mutual confidence between the Troupe and its audience.